A recent Bank Think post by ConnectOne Bank CEO Frank Sorrentino regarding restoring Glass-Steagall got me thinking about how far the debate has drifted from the root causes of the 2007-08 financial crisis. There have been quite a number of research pieces offered as to the root causes (read a good one here by University of North Carolina). In researching this post, I sifted through some interesting, and some not so interesting opinions. Which reminds me that the old axiom "figures don't lie, but liars figure" may be closer to accurate than we would like. Here is what I think caused the financial crisis based on what I read, what I experienced, common sense, and my interpretation of the facts. 1. People borrowed more than they could repay if they experienced a modest financial setback. If you know me personally, I will always put more weight on personal responsibility than the boogeyman. Yes there was some degree of fraud perpetuated on the borrowing public. But, by and large, people knew how much they were borrowing, what their payments were, and that some of their mortgage payments would rise if rates rose. In 1974, household debt stood at approximately 60% of annual disposable personal income. In 2007, that number climbed to 127%. It should be noted that in 2006, 40% of purchase mortgages were for investment or vacation property. But you won't see the real estate investor losing his/her shirt on 20/20. Absolving people of personal responsibility is a problem in our society. As one of my Navy lieutenants once told me: "Be careful pointing the finger, because the other fingers are pointing back at you". Words to live by. So, in my opinion, number one exceeds all others. It will not get me personal kudos in the news media. 2. Credit risk was too far removed from the loan closing table. This is the moral hazard argument, where the people that have the relationship with the customer, that stare the customer in the face and say "yes" or "no" to the loan, were not the same people assuming the risk should the customer default, in most cases. The shoulders where credit risk ultimately came to rest, investors, were placated by insurance and bond ratings. Community financial institutions make their debut here, as they purchased bonds, typically highly rated, backed by mortgages that also had insurance applied to them. 3. There was a lot of money looking for investments, and Wall Street met the demand. Mortgage-Backed Securities (MBS) almost tripled between 1996 and 2007, to $7.3 trillion, as investors lined up to participate in the US housing market. This led to creative means to take a risky mortgage at the closing table, to a perceived "safe" investment in the bond market after it was combined with hundreds of other mortgages, parsed into traunches, insured by a bond insurer, and rated by a ratings agency. What could go wrong? 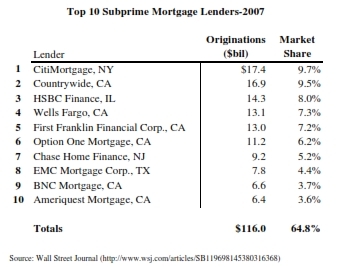 See the list of top 10 sub prime mortgage lenders from 2007. Note the absence of anything resembling a community bank. BNC was owned by Lehman Bros. EMC-Bear Stearns. First Franklin, a JV between National City Bank (emergency sale to PNC) and Merrill Lynch (emergency sale to BofA). Option One was sold to shark investor Wilbur Ross for its servicing rights. Ameriquest was purchased by Citi, and its origination arm shut down. The table indicates that loans were closed in these banks'/entities' names. 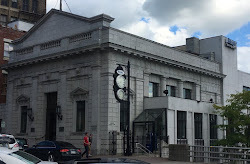 A community financial institution that sells its loans in the secondary market would typically close the loan in its own name, and then sell it. So the absence of community financial institutions implies that these loans were originated by mortgage brokers or the listed banks themselves, and not a community FI. This is consistent with my experience. The MBS bond-creation engine was a well oiled, end-to-end machine designed to satisfy the appetite of investors. 4. Government's participation in the mortgage market. Way back to the Great Depression, when mortgages were typically five-year balloons, the Federal Government has intervened in mortgage lending. When the five years were up, the government didn't want people tossed from their homes because they couldn't refinance due to economic hardships. A respectable goal. But this intervention played a role in what we have today, a separation between the borrower and the ultimate lender. Note that Presidents Reagan, Bush, Clinton, Bush, and even Obama openly encourage home ownership because it has a causal relationship with household wealth creation. But the reason why community financial institutions shy from putting 30-year, fixed rate mortgages on their books is because there is no 30-year, fixed rate funding instrument. It creates unpalatable interest rate risk. If interest rate risk drives the wedge between borrower (i.e. homeowner), and the desired lender (i.e. local bank that retains the credit on their books), then perhaps a 5/1 mortgage should be the norm. This answers the interest rate risk problem, while allowing borrowers to keep their mortgage and therefore their home if they befall some economic setback after five years. And note, a local financial institution has more flexibility to alter the terms of the loan if it is on their books, rather than owned by an investor. Back to my original point regarding re-instating Glass-Steagall. What does this have to do with the four points above? We should ask the same question about every article within Dodd-Frank. Great post this month. I'll add two more items and a sidebar. 1) Drive by appraisals. It's hard to get a good valuation from a photo and a comp based upon a bunch of inflated comps to begin with. Garbage in, garbage out. 2) The use of home equity loans/lines. Consumers were granted access to a funding source that increased their ability to create even more financial leverage. It was possible to refi, get a better valuation, and take more equity out than before. The sidebar is our neighbor to the north, Canada. If I understand correctly, their mortgages may have amortizations longer than five years, but they balloon every five years. Correct? I agree with your items 1 and 2. In fact, I know a community banker that used to wait in the bank lobby on payday for delinquent customers. He would pull out the promissory note and ask the customer to read the first four words back to him (I promise to pay). They did not have a lot of credit losses at that bank. Your assessment about Dodd-Frank is spot on. Community banks did not create the mess, please don't shoot the survivors. The link below is a recent article from the LA Times regarding the Canadian mortgage system. The typical terms are five-year balloon, 25-year amortization. The author of the article fails to review US history to the Great Depression when the FHA interceded to reduce the five-year balloon, signaling the long-term decline of such instrument, which the LA Times author seems to admire about Canada (five-year balloon mortgage). Interestingly, the author says that government intervention helped Canada, and deregulation hurt the US. I think the "F" in FHA stands for Federal. Typical LA Times editorializing. Cut and pasted from any issue.